A study done by Stanford University of Medicine on the use of oxytocin as treatment for children with autism revealed that children with low baseline oxytocin levels exhibited improved social behaviors. The study, which was published in the Proceedings of the National Academy of Sciences, was the first one conducted on how oxytocin baseline levels can affect the children’s responses to oxytocin treatment. Autism is a neurodevelopmental disorder and it is characterized by difficulties in verbal communication, impaired social skills, and restrictive and repetitive behaviors. Autism symptoms vary in terms of severity and children who have autism are not equally affected. Autism specialists are often able to diagnose the condition before a child turns two years old, but people can be diagnosed at any age. There are several cases when it is hard to produce a diagnosis since the disorder comes with various symptoms which can be undetected or unnoticed for a long time. Symptoms may range from fixations and repetitive actions to communication issues, but its symptoms can be improved by treatment over time, depending on the specific needs of the child. There have been several studies conducted concerning autism treatment. In 2014, the lead author of the study, Dr. Karen Parker, associate professor of psychiatry and behavioral sciences, and senior author, Dr. Antonio Hardan, professor of psychiatry and behavioral sciences, discovered in a study that oxytocin levels vary among children regardless if they have autism or not. They found out that children with low baseline oxytocin levels experience more social impairments than those who have high levels of it—whether or not the children have autism. 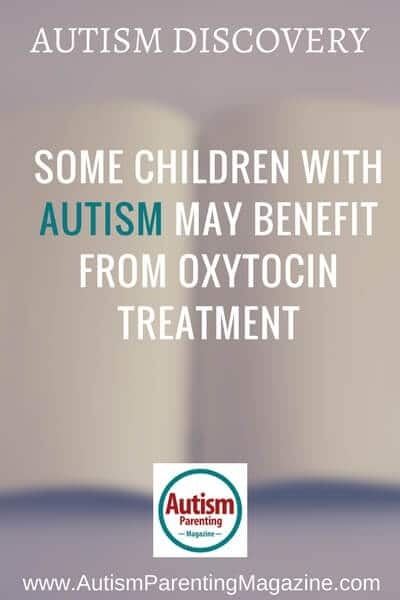 This discovery led the group to explore the possible effects of oxytocin in autism therapy when it is confined to those children who have low baseline oxytocin to begin with. There were other tests conducted about oxytocin, but the children’s baseline levels of the substance were not taken into account. According to Dr. Parker, it can be deduced from the study they conducted that the baseline oxytocin levels of children with autism can serve as a biological indication if he or she will respond maximally in an oxytocin therapy or not. The said clinical trial was conducted on 32 children with autism. One group was administered with a nasal oxytocin spray treatment twice every day for a period of four weeks. The other group was administered a placebo spray in the same manner. The children were assessed at the beginning and the end of the trial through standardized questionnaires that were completed by their parents. The hormone was observed to be safe for use and it did not exhibit any adverse effect. The clinical trial showed that the benefits of oxytocin were only manifested on children with low baseline levels of the substance in terms of social behavior. There were no changes observed on the children’s anxiety levels and the frequency of their repetitive behaviors or tics. Same as the previous trials conducted, the researchers also observed improvements among children administered with a placebo but the effects were not as pronounced as those of the oxytocin group. Children who have low baseline oxytocin also benefited more from placebo compared to those who have high levels of it. Interestingly, the children’s bodies also showed a significant increase in the production of the hormone. This particular finding suggests a possible explanation for placebo’s beneficial effect as it is often the subject of study in the fields of psychology and psychiatry. Recently, there have been several trials conducted across the United States on the use of oxytocin for children with autism. Drs. Hardan and Parker are waiting to find out if the results of such studies replicate their findings. Hardan, who is currently treating children with autism at the Lucile Packard Children’s Hospital Stanford, does not advocate the use of oxytocin on patients yet. According to Harden, he will only advise on measuring baseline oxytocin levels as part of his practice to determine if particular patients will respond to oxytocin when their findings will be replicated on a large scope National Institutes of Health funded trial.